The Islands Bill, which aims to offer greater protections and powers to Scotland's island communities, was unanimously passed in May. Thanks to an amendment from Mr Scott, it also includes a "Shetland mapping requirement". 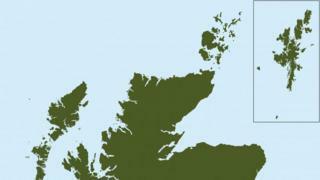 The Lib Dem MSP said the common practice of placing Shetland in a box off the Moray Firth or the Aberdeenshire coast was "intensely annoying" to islanders, and created a false impression of the challenges they face on account of their remote location. The final rule written into the bill requires the islands to be "displayed in a manner that accurately and proportionately represents their geographical location in relation to the rest of Scotland" in any documents published by Scottish public authorities. However, it does note that authorities can avoid complying with this if they provide "information" about their reasons. Mr Scott said it was "ridiculous" that he had to change the law to close the box. He said: "There is no excuse now for the Scottish government, its agencies or others to put Shetland in a box. The box is closed. It doesn't exist, whether that be in the Moray Firth or east of Orkney. Shetland is now in the right place. "This Islands Act must go a whole lot further. Islands proofing - ensuring the islands are recognised in any law or government regulation - must work." Islands minister Paul Wheelhouse welcomed the requirement coming into force, alongside the rest of the bill. He said: "The Scottish islands have contributed and continue to contribute hugely to our culture and heritage and, with this act now starting to take force, will now have the opportunity to contribute even further to their own and our collective futures. "They have very distinctive needs so the act introduces a number of measures to ensure there is a sustained focus across government and the wider public sector to meet the needs of island communities now and in the future." Only the Scottish Conservatives spoke out against the move at Holyrood, with MSP Peter Chapman calling it "impractical" and warning it would reduce the amount of detail in maps due to changing scales. This was backed by the Ordnance Survey mapping agency, which said inset boxes avoid "publishing maps which are mostly sea".